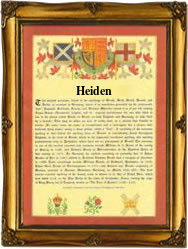 Recorded in the spellings of Heide, Heid, Heiden, Heidling, Heideling, Heidt, Heyde, and as an ornamental compound such as Heidbrunner, Heidebreck, Heidenreich and many more, this is a surname of Germanic origins. Originating from the pre 7th century word "heida", it was both a topgraphical name for somebody who lived on heathland or moorland, or who in medieval times was regarded as a heathen! This was a nickname for one who perhaps was regarded by his friends and neighbours as anti-social, however one of the difficulties with nicknames is that they often meant the complete opposite of what they appear to say, and it may even have been given to one who was regarded as rather too civilised. It was also a nickname given to European Crusader knights fresh from their various and failed attempts in the 13th century, to wrest the Holy Land from the Muslim. This outburst of "Christian" energy was financed in most countries by excess tax, a form of "giving" not always appreciated by the donors, as no doubt in this case. However the surname prospered and amongst the early examples are those of Johannes von der Heyde, the burgmeister of Leipzig in 1345, and slightly earlier, Heinrich Heiden of Hertenberg in 1312.